Be skeptical of miracle schools. Sometimes their dramatic gains disappear in a year or two or three. Most such claims rely on cheating or gaming the system or on intensive test prep that involves teaching children how to answer test questions. These same children, having learned to take tests, may actually be very poorly educated, even in the subjects where their scores were rising. Whenever a school has a dramatic increase in test scores in only one or two years, ask questions about the participation rate: How many kids started the school? How many were tested? Were low-performing students held back in a previous grade to inflate the scores? Reporters should also check to see if there has been any verification to make sure that there was no cheating (e.g., a high erasure rate, changing scores from wrong to right). Who graded the papers? Did teachers have access to the test questions before the test was given? If so, they might have taught the test questions during practice sessions. Ask questions of charter schools about skimming, excluding, winnowing out low-scoring students. Ask about the proportion of special ed students, and watch for numbers of spec-ed that do not include the most severely disabled. Many charters take children with the mildest disabilities while leaving the most challenging spec-ed to the regular public schools. Ask about the proportion of Limited English Proficient/English Language Learners (LEP/ELL) students. Most charters have exceptionally small proportions of LEP/ELL as compared to local public schools. Whenever a district has a dramatic increase in test scores, look for cheating, gaming the system, intensive investment in test prep. Testing is NOT instruction. It is meant to assess instruction, not to substitute for it. When a charter school reports miraculous results, be sure to ask about the attrition rate. Some highly successful charters push out low-performing kids and their enrollment falls over the years (and the departing students are not replaced). Recently Arne Duncan hailed a “miracle” school in Chicago—Urban Prep—where all the students who graduated were accepted into college. But 150 students started and only 107 graduated. The 107 graduates had much lower test scores than the average for Chicago public school students. The school did a good job of getting the students into college (perhaps that was a miracle) but they were not better educated than students in the regular public schools. In another instance, one of the “amazing” schools singled out by the 2010 documentary “Waiting for Superman” admits 140 students, but only 34 graduated. That’s a 75 per cent attrition rate. Some miracle. One of the central claims made in “Waiting for Superman” is that 70 per cent of eighth grade students in the USA read “below grade level.” That statistic is wrong. Someone misread the federal testing program data. The relevant figure was “below basic.” Twenty five per cent of eighth grade students are “below basic,” not 70 per cent. What is the state’s passing mark on its tests? In some states, a student may be considered proficient by answering correctly only a minority of the questions on the test. There have been instances of states lowering the passing mark (New York and Illinois, for example), to raise the proportion of students marked proficient. New York dropped its passing mark in some subjects and some grades over a four-year period, leading to ecstatic press coverage about rising numbers of students who were proficient. When the game was revealed by an independent audit (a rarity), the state had to admit that almost all the previous gains were phony. Be aware of the source of research about school choice. Many advocacy organizations release “studies” that have not been peer-reviewed, with the intent to proving that choice is successful. Look at what has happened in Milwaukee, where researchers used to argue about whether vouchers were working. The argument is over. After 20 years of vouchers, even voucher advocates admit that students in voucher schools are doing no better than students in regular public schools and students in charters. And all three sectors are doing poorly. The theory of vouchers and charters is that competition will cause achievement to go up in public schools, and a rising tide will lift all boats. But according to the latest National Assessment of Educational Progress, black students in Milwaukee public schools score below black students in Mississippi, Alabama and Louisiana. And voucher students do no better! So voucher advocates now say that the goal of vouchers is not to improve test scores but to increase parental involvement or to provide choice for its own sake. That is called moving the goal posts. Have you looked at the broad range of charter studies? With only one exception, they show that charters on average do not produce better academic results than regular public schools. The one exception was Caroline Hoxby’s study of NYC charters. In that study, which was not peer-reviewed, she claimed that students who attended charters for nine years would close the Scarsdale-Harlem gap. The press gave that study huge attention and credibility, but no one noticed that there were very few students who had attended a charter in NYC for nine years or that Hoxby did not provide a number for the students who had closed the gap. It appears that her study was an extrapolation, and it was an extrapolation based on NYC and NY state’s inflated and unreliable test scores (see above). When NYC’s charter scores are reported, they range widely from very abysmal (a six per cent pass rate) to exceptional (100 per cent pass rate). Follow the money: One of the funders of “Waiting for Superman” was Philip Anschutz, a billionaire who gives generously to free-market, pro-voucher think tanks. Another funder was previously CEO of a string of for-profit postsecondary institutions. Follow the money: Check out the groups promoting charters and high-stakes testing and policies that link teacher evaluations to test scores. In particular, who is on the board of Democrats for Education Reform? Why the huge interest of Wall St. hedge fund managers and big real estate moguls in charters? What are the connections among DFER, Education Reform Now, Stand for Children, the state CAN organizations (e.g., ConnCAN), and a host of other groups promoting privatization and de-professionalization? Also NewSchools Venture Fund? And the big foundations: Gates, Walton, Broad. Since no high-performing nations are pursuing such policies, why are these well-funded groups promoting policies that have so little evidence behind them? Why has the Obama administration embraced the accountability policies of the Bush administration? Why does the president publicly say he is against standardized testing at the same time that his administration is demanding more emphasis on standardized testing? Why has the Obama administration embraced choice, which was a staple of the GOP agenda? Why do the corporate reformers promote merit pay, even though study after study has shown that it has no effect on test scores? Principles for reporters: Be skeptical; don’t believe in miracles; follow the money. Diane gets it absolutely dead on. Follow the money has never been more relevant. The entire educational deform movement has NOTHING to do with kids or improving schools. It's about making a huge profit out of designed school "failure," designed by those who created a system of evaluation included in NCLB that eventually will call ALL public schools failures. You're welcome, Joan. I appreciate the compliment. I would add that this movement is following a familiar script, one that has been well analyzed by Naomi Klein in THE SHOCK DOCTRINE: THE RISE OF DISASTER CAPITALISM. Think New Orleans & Katrina. Think the utter dissolution of Detroit. Think the Iraq Invasion from the perspective of Blackwater, Halliburton, et al. Posted by Jose-Manuel Navarro, Ph.D. I taught for eight years in what was then a bilingual (Spanish & English)program in a public school in Philadelphia. My students were firs generation Puerto Ricans and Dominicans. Some parents, seeking a better schooling, as they said, took their students out of our program and enrolled them in a local charter school. In over 90% of the cases, the students were back in our program the following year. Why? The parents did not like the lack of cultural programming, comfort their students felt with the teachers of their own background in our program, and the attention we paid to them and their children. All of these statistical studies of public school vs. charter schools are used to divide the poor and lower middle class parents who would do better pressuring the school systems to provide the proper environment for teachers in public schools to teach, e.g., lower number of students in classrooms, aides to the teachers, adequate textbooks, insuring parental involvement, cultural sensitivity sessions for teachers and administrators about their students and parents, and the funds to teach our children. Why is is that the corporate model of education is taking over our educational system when there is no analysis of how that does not work? Why do we hear all about "testing failures" and not the importance of learning? Why do politicians, who as a whole know nothing about education and usually send their children to private schools where equivalent accountability of public schools is non-existent, enact laws faulting teachers and not the lack of true commitment to education that our Nation needs? Why are teachers demonized for "failures" really caused by poverty, social, ethnic, racial and economic oppression and not heralded for the heroic job they do daily? I think it's because our Nation does not really care about the poor and have-nots. At the rate we're going with this educational reform charade, all public schools may become controlled by charters, religious groups, or for profit organizations. Forgive what may seem an exaggeration, but the whole thing is looking more and more kafkaesque to me. In 1935, my great-grandfather sued the City of Chicago School Board for corruption in the selection of principles. The process involved a written exam and an oral exam. All scored well on the written exam. The oral exam was done behind closed doors, and was entirely corrupt. Bribery, favoritism, corruption were then, and this is what the corporate interests want today. There are BILLIONS of dollars in education. The teachers' unions, the lack of access of for-profit corporations, the non-profit nature of education, all of this is a tantalizing target for the corporate scum out there. They want the money. Education is not the issue. It's the money. I like Dr. Ravitch. She says all the right things. Just wish she had champion these causes earlier in her career as she climbed the coporate educational ladder herself. She was a advocate for the same people she challenges today. She did more harm than good then. I have lots of respect for her and admire her tremendously and still do and its never too late for her advocacy just wish she had joined us earlier because she too profited from it in the past. "Policymakers pushing charter school expansion ask taxpayers to overlook the business side of the equation, using children and school choice as a distraction from deals that benefit investors at the expense of classroom spending. Allen County tax officials have done Indiana taxpayers a favor in prying open the Imagine real estate playbook. Legislators would be wise to slow their rush to pass a charter bill until ensuring there are safeguards to keep Indiana tax dollars in Indiana schools. The tangle of leases and subleases, for-profit management organizations, charter school boards and real estate investors involved in some of the state’s existing charter schools begs for transparency before more tax dollars start flowing out of state." Thank you, thank you, thank you. You are a voice of reason and I hope this gets out to many reporters. The discourse surrounding education needs to be shifted to these important points you made. Thanks again. Regardless of the bickering over money, many children are failing. The schools of education and the politicians put the public school system in this position when they drove education spending like a bubble and promised great things. If you don't want it to be about money then don't make it about money in the first place. Meanwhile, Diane asks why Obama is doing the same thing? Because he is a politician and has no other options. It's unfortunate for teachers because most of the blame lies with parents not doing their part but Obama (and those before him) can't blame their own voters for obvious reasons. Kudos to Diane Ravitch for hitting this nail dead-on the head. Many of us have been working to get the media to move into the forefront of asking the tough questions that Diane raises in this excellent article! Another key question, that perhaps must come from the public to the media sources we depend so much on... to what extent are they spending time with "movers and shakers" in the "school reform" movement. Our less than "transparent" education reformers in Louisiana spend lots of time in meetings with the Editorial Boards in newsrooms and newspapers across the state. They have an almost infinite amount of time and money to promote their causes and to chastise and pressure those who do not toe their "party" line! Great job! the posision you held should of alerted you to what was or is going on and if you know much tou knew what was going on you should of put a stop to it so in my eyes you are just like then so what wsd your cut! Choice for the sake of choice! The anti-charter, anti-voucher lobby assert (incorrectly, I know first hand) that regardless of the type of school, the educational achievement is more or less the same. If so, then why oppose having choices, since you say it doesn't even matter anyway? Maybe a parent likes one charter's uniform code as more comfortable for their children. 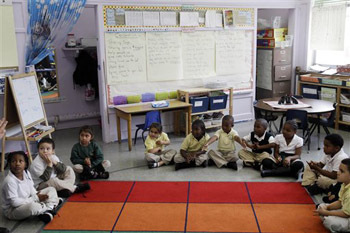 Small differences among schools can be large in the lives of individual children. Of course, the real issue is that the teacher's unions want all authority without responsibility or accountability. That's why they want to compell every parent to send their kids to a conventional public school. The more students in charters or on vouchers, the fewer potential union members. We can only pray that one day the school choice lobby will be remotely as powerful as the teachers union anti-choice lobby. Follow the money, indeed. Posted by Carl B. Wagner, Ed.D. I admire Dr. Diane Ravitch for her honesty and insights. The money taken by corporate interest that have the control of the legislators, governors, and local politicians certainly justifies Dr. Ravitch's truth about "following the money." I am appauled at the blatant arguments by labor unions fixed on maintaining the status quo pushing for nothing more than a paradigm of "show up, shut up, and do the assignment." Parents, too, have placed their faith in merely asking that their children "to the work." Learning is not the priority in many of America's schools. Parents who want their children to enjoy sports, dances, homecoming disruptions, assemblies, and entertainment ignore the reality that learning should be a greater focus than the Friday night football game. Teachers represented by unions contend that there are too many absent students, too many undisciplined kids, not enough punishments, too few parents at conferences, and lazy students. The fact that young adults are so used to sitting and pretending to listen and then maybe doing some worksheets and calling this schooling is simply not discussed. Bad as testing, especially narrowly limited objective testing, can be, it is often not even learning for a test that distracts teachers, parents, and students from their focus on athletics, community service, parades, band festivals, and a host of other very worthwhile activities that take attention and time and focus away from schools of learning. A separation of athletics and entertainment from academics as is so often done in other nations would allow students to view school as a place to learn. America is inundated with "Schools of Compliance" and "Schools as Funnels for Funds to enrich corporate interest." What is needed are "Schools of Learning." Thank you, Dr. Ravitch for shining a light on the value of genuine learning and the ownership of learning among our students. Georgia doesn't have a teacher's union so there's no pressure from the unions. The pressure is from politicians eager to cash in on the money available from for-profit corporations. I can also answer why a school board member or superintendant can't stop this bleed of tax money to corporations. The paid for State politicians in our state managed to take control away from the locally elected school board who opposed the charter. We are going to incur a milleage increase on our taxes to fund Charter School USA and Red Apple Development in a lease, sub-lease, giant mess where our money is funneled out of state while our public schools are cut to the bone!